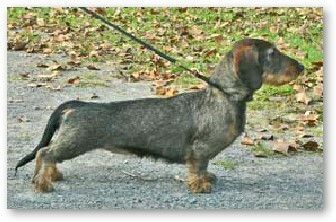 "Emma" (FC Asta von Moosbach-Zuzelek) is a daughter of Alfi and Elli. She grew up with Deutsch Kurzhaars and was trained as a versatile hunting dog. She came back to us in September 2006 due to her previous owner's personal situation. After her thorough evaluation, we decided to keep her for ourselves. This dog can hunt, actually she lives for hunting. She is responsive and wants to please yet she is psychologically tough. She fits very well into our breeding program. In 2007 Emma whelped her first litter of 7 puppies - Nimble, Nurmi, Nelli, Nadina, Niki, Nevada and Nettie. 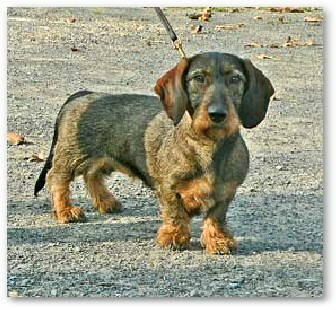 The sire was FC Clown vom Talsdeich ("Buster"). 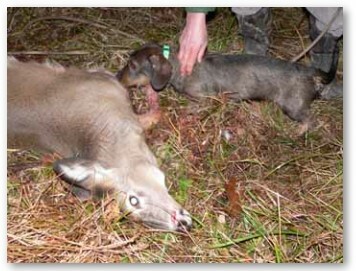 Emma and Buster's pups have done extremely well in their first tracking season when they were just 5-6 months old. 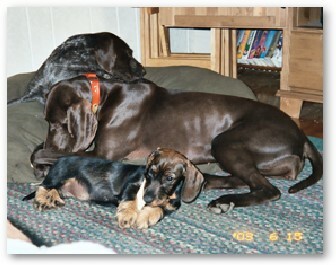 In 2008 Emma had 2 puppies and their sire was Henri Anons. Frodo and Frida are doing very well. Emma's conformation was rated "excellent" and she is very agile. Her excellent coat, overall balance and outstanding temperament are very impressive. Emma opens on rabbits with a strong voice, and she is an excellent flushing dog. We like her work on artificial blood lines. In summer 2008 she passed the NATC Small Game Hunter test; she is also AKC Field Champiuon. Emma grew up with Deutsch Kurzhaars and was trained in the versatile hunting dogs tradition. Emma with the doe she recovered for John in December 2006. Emma playing with John's grandson Ben. 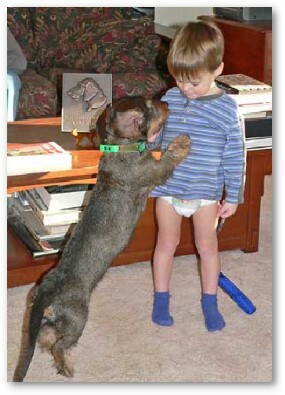 Dachshunds and Ditch Parrots…they are not just for rabbits anymore! “It is a far cry from my usual methods!” I think to myself, as I walk along a roadside ditch in central Iowa. To my right a CRP field, my usual choice. But this is late afternoon, my shorthairs are put up, and I’m looking to fill my bag with just one more rooster. As I walk along I am kept aware of my hunting partner’s actions by the rustle of the grass and the music from her bell. Emma (Asta vom Moosbach-Zuzelek) is a tireless worker, stopping only occasionally to check on my whereabouts and get a “good girl”. Sometimes her nose gets the best of her and she begins to get out too far. But, a couple of “toots” on the whistle, and she realizes the error of her ways, scampering back to continue her search. Looking ahead, I see the ditch interrupted by a field access bridge about 75 yards ahead. As if almost on queue, I hear Emma open. Not the usual tongue reserved for furred game, but a strong, sporadic one that tells me pheasants are afoot. I’d like to say we calmly and coolly flushed and shot our bird, but Emma and I do little calmly and coolly when running roosters are involved. As I speed up my pace, the first rooster busts from cover too far ahead for a shot. Emma is steady barking now so I turn my attention back to the ditch in time to see two hens make for safety. Now we’re running out of ditch, but Emma is still making game. About 5 yards from the end, Mr. Ringneck announces his presence with a great ruckus. Fortunately for me his path of escape provides me an easy going away shot. Crossing the ditch to retrieve my prize, I find Emma has beaten me too it, and has things well in hand. She is none to happy giving up “her rooster”, but a quick clip of the game shears, and she has a wing to shake, chew and bark at. “Hat Trick!” 3 pheasants in the bag, and a great day afield! Most people are aware that pheasants spend a great deal of time near roads, hence the nickname “Ditch Parrots”. In early morning and late afternoon these roadside ditches provide excellent cover for wary birds. Roads bordered on both sides, by CRP or cut grain fields, with ditches having knee high grass are ideal. 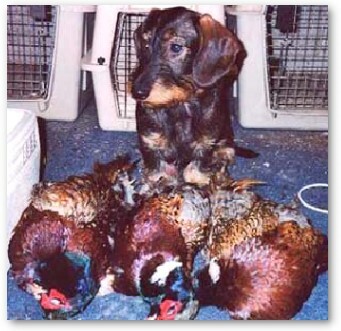 Though not commonly thought of as “pheasant dogs”, dachshunds adapt themselves well to this kind of hunting. In general the cover is skinny and straight, concentrating the birds and not allowing them to circle back behind you. Walking along on the high side of the cover, letting the dog(s) work the bottom works best. Remember to watch ahead for breaks and/or obstructions in the ditch that may cause a fleeing rooster to flush. If hunting with another person, have them station themselves ahead to block the bird’s path. Break the ditch into smaller sections, hunting each section thoroughly before moving on to the next. Keep talking to a minimum, with any needed communication just above the whisper level. A locating device, a bell or beeper, aids immensely in keeping track of your partner. I find the bell of greater benefit due to its constant ringing. I hunt all of my dogs with an e-collar, regardless of their level of training. First because mine has a “locate” feature, I can use to find my dog if it gets out of earshot. And second, it affords me control of the dog in case some dangerous situations arise. I like to use a 12 ga for this type of gunning, loaded with at least 1 1/8 oz. of #4’s. Almost any gauge will do the job; I just like to “anchor” my shots. The shooting can be fast and furious, with long lulls of nothing. So use a gun you are comfortable with.